Mrs. Crucis and I had a great weekend. 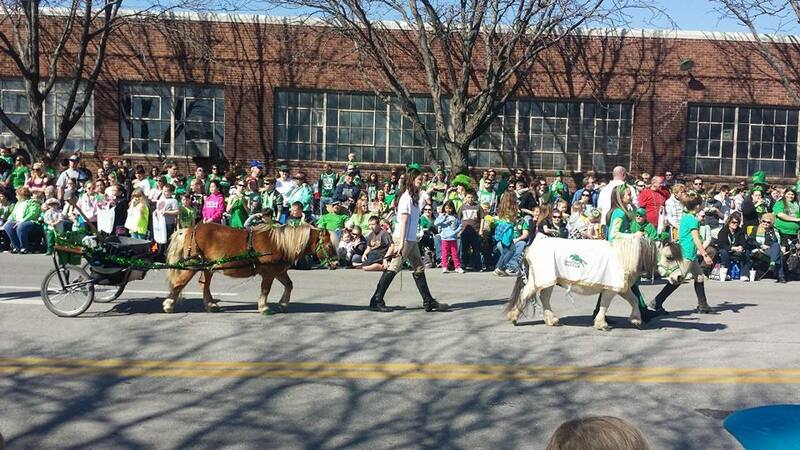 Locally, a number of small towns and cities had St. Patrick’s Day parades on Saturday. Kansas City will have theirs today. KC used to have theirs on Saturday, too, but the ‘purists’ complained. So now, KC has theirs on the 17th, a workday, disrupting traffic, blocking a number of major thoroughfares, filling parking lots leaving regular employees without spaces, and giving the unmotivated an excuse to skip work, watch the parade, drink and get drunk. It’s an annual affair in KC. “You’re against the Irish!” some will say. No, I’m half Scots-Irish. My grandmother was born outside Dublin, my grandfather was born in Edinburgh, Scotland. I’m not against Irish, I’m against the stereotypical drunken Irishman. There is another significance with St. Patrick’s Day. It’s the beginning of the political campaign season, the first big event for the pols to parade before their constituents to make their names known. 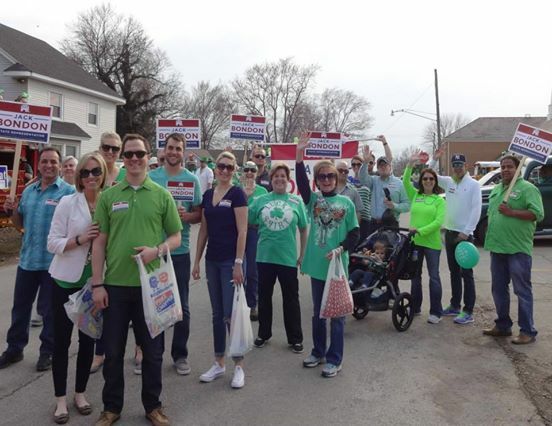 Mrs. Crucis and I walked in the parade Saturday to support a friend who is running for State Representative. The parade was in his state district, and, he asked me to walk for him. I will be walking in support for other candidates in the future when more parades and cities festivals are scheduled. Local elections are the entry levels for politicians. For some, it is running for city council. For others, it may be running for county or state office. But there is one thing many have in common—it’s their first step into the political arena; how can they stand out from their opposition? I am no political campaign strategist. I’m just an observer. I’ve seen tactics that work, and don’t work. First tip to politicians: Don’t lie to the people. You will be caught sooner or later. Don’t pretend to be what you aren’t. Case in point. A state representative in another part of Missouri ran, in the last election, as a conservative, supporting a number of conservative issues like the 2nd Amendment. Last year, the Legislature passed a bill that included a number of items to support the 2nd Amendment and expand self-defense and gun rights in Missouri. Despite all his talk, his campaign promises, when push came to shove, this representative’s support wavered. He stood in the background and did not support his fellow conservatives. He’s up for reelection. This time, last I was told, he faces a number of primary opponents. What is the lesson for politicians in this example? The pol I described above was all talk. He claimed he supported gun rights. After his failure to support those claims, opponents began to investigate his background. What did they find? This so-called 2nd Amendment supporter did not own any firearms. He didn’t have a CCW certificate. He did not hunt. He did not subscribe to any of the more popular organizations like the NRA, GOA, 2nd Amendment Foundation, or JPFO. So how could he really claim to support the 2nd Amendment? He couldn’t. I expect he will be out of office come January, deposed in the primary. Who is supporting you is also critical. Opensecrets.org will show who financed incumbents. When you see who is financing your opponent, make sure YOUR supporters are those whom you would be proud to acknowledge. In the last election, a state representative decided to run for an open State Senator seat. He ran as a conservative…until it came to unions and Right to Work. A major source of his funding and support came from unions. His major opponent was well known for supporting Right to Work…as were ‘Pubs in general. The candidate couldn’t support some of the issues that his party did. In the end, he lost the primary. He could not distinguish himself, as a ‘Pub, from democrats. How can you separate the RINOs from the real conservatives? See if they get union funding. The unions fund liberals, democrats, and RINOs. If a ‘Pubbie takes union money, he’s sold his soul. Don’t vote for him, he’ll betray you when it counts. The opposite is also true. In the last election cycle, a friend ran for office on the democrat ticket. He refused union money. Strangely, the promised funding from other democrat organizations failed to appear. Democrats commonly use unions to launder campaign money. It’s the democrat way. Some campaign strategists say that funding is the major point in winning elections. Those who raise the most money, wins. Often, that is the case. However, you must also have core principles and be consistent with them. How often have we been sold a political product only to discover that product was an empty suit who had no principles other than to gain political power? John Boehner and Mitch McConnell are excellent examples. In Missouri, Chris Koster started his political life as a ‘Pub county prosecutor. Then he turned his coat to be a democrat to run for Attorney General. If you claim to be conservative, you can’t be a partial conservative. The time for fence sitters is over. The nation and the states are heading for a crisis and it’s time for taking sides. Candidates can no longer say they are fiscal conservatives but not social conservatives. The two are irrevocably linked. You principles cannot shift in the wind of political events. You can’t be against Obamacare and then vote to allow funding—as did many ‘Pubs in Congress a few weeks ago. They think we’ll forget. We won’t. The time for allow such hypocrisy has ended. You cannot claim to support smaller government, reducing welfare, lowering taxes while advocating for open immigration and amnesty for illegals. The whole world does NOT have a right to live here, usurping the heritage built by our parents and ancestors and existing on the largess of those who built this country. The excuse, “they do jobs our citizens won’t,” is a lie. The truth is that illegals undermine state economies across the country taking work from citizens while contributing nothing back to those same economies in taxes. Politicians, establish your core principles and stand by them. There are as many critical issues at the local level as there are at the national level, such as Common Core in Education, Sustainability, a relabeling of Agenda 21, that attacks our property rights, to ponzi-scheme TIF arrangements that bankrupts cities when the promised revenue never arrives. In fact, if you do a bit of Google research, you will find strong connections between Sustainability, TIF financing and local governments, and the educational failure of Common Core. So, politicians, be sure where you stand, what you support and what your opponents do or don’t support. All will provide issues to separate you from the herd, make yourself known to the electorate and find common ground with them while separating those voters from your opponents. Now go, be that fiscal and social conservative you say you are, support your local towns and cities, end Common Core and make your local school board responsible and accountable for education—don’t let them shift the blame to the state or the feds, end the ‘Sustainability’ fraud the curtails property rights and allows government to seize your property because they say you aren’t using it properly, support the 2nd Amendment and halt the wave of statist attempts to disarm the people of this nation. Be aware, that in the end, it is these issues and more that are the conservative core and it is the 2nd Amendment that preserves the Constitution and liberty for all…not for just a few elitists. I had a discussion with a friend yesterday and the conversation came around to Rand Paul. We both agreed that he looked good when he was first elected. Then we tried to think of any accomplishments. We were at a loss. While Paul has generally been considered to be conservative, he has failed to implement those philosophies. The one thing that we could remember was that he supported Ted Cruz’s and Mike Lee’s cloture filibuster last year on a bill and stood up to filibuster a gun control bill. All that was last year. This year Rand Paul, the junior Kentucky Senator, has an opportunity to rid the Senate of a liberal elite, Mitch McConnell. He has remained silent for the most part and when directly asked about McConnell, skirted the issue. I had great hopes for Rand Paul as a saner version of his father. Saner, yes. More effective, no. Talk is cheap, Rand, but it is action that is important. And, it is his actions that creates more disappointment. I would expect, if Rand Paul won’t support conservatives against McConnell, he would at least remain silent. Unfortunately, Rand Paul is on record attacking Matt Bevin as a McConnell surrogate. Such acts makes me wonder what McConnell has on Rand Paul. In light of the recent release Sherlock Holmes starring Robert Downey, Jr. and Jude Law as Holmes and Watson respectively, Chris Muir has this appropriate cartoon published on Sunday, January 3rd. I came across this article while scanning the St. Louis Post Dispatch online paper. From the comments, Billingsly is being scorned and abused by blacks and liberals because he dared to speak his mind. Here’s an sample comment from a reader. Billingsly sounds like a 2-year-old who can’t have any candy. Boo-hoo! Perhaps he should consider moving to another country, where they will respect his political viewpoint. Billingsly makes Sean Hannity seem like Ted Kennedy. I’ve included the article in its entirity because I don’t know how long it will be allowed to remain on the website. As Jack Buck once said, “I don’t believe what I just saw!” Americans on Nov. 4 turned over control of the United States of America to a management team possessing no executive experience, having never run, as I liked to put it, nothing. Well, Americans usually get the government they deserve, and I urge you all to get ready for this 21st century version of amateur hour. It’s going to be an embarrassing and dangerous time for America and American ideals. There won’t be much, I’m afraid, to be thankful for. Bill Kristol, writing in The Weekly Standard, reminded me that every 16 years we get a Democrat president with no experience in national security or international affairs who’s elected after Republican presidents have made and kept America safe: After Eisenhower, we got Kennedy; after Nixon/Ford, we got Carter; after Reagan/Bush, we got Clinton. And after Bush II, we get Barack Obama. Every strong Republican president who succeeded in protecting America has allowed Americans to become complacent about national security, thereby opening the door for weak Democrats who allowed enemies to threaten and attack America without penalty. Obama will be no different, and Americans will have to learn again that there can be no economic security without national security. That’s not to say that Obama’s election doesn’t come with a couple of interesting side effects. For example, henceforth no black man in America may be called unqualified for any job that he might seek, no matter his prior education or experience level. Want to be a nuclear scientist but lack a Ph.D. in physics? If the applicant is a black man, it’s no problem. Just offer hope to the profession and promise change from all those stuffy theorems that have given the discipline its structure over the years, and you’re in. That’s on a par with throwing out the fact that tax cuts lead to more investment, job creation and increasing government revenues, just because the black man, that transcendent agent of change, says it’s OK.
Another side effect has been white people contacting me to say that I should be proud to see a black man become president. Could there be a comment that is more condescending, more insulting, than that? If I believed that in America a black man could not be president, then I would be proud to see any black man elected president. But because I always have believed that nothing in America prevents a black man from becoming president or anything else he wants to be, I can be embarrassed, not proud, to see someone as unqualified and inexperienced as Obama become president. Jackie Robinson, the first black man in modern-day major league baseball, illustrates my point. He was the right man with the right combination of talent, temperament and character at the right time to be successful for that important “first.” Obama? An empty suit who will fail. I’m going to approach the Obama years the same way liberals handled the Iraq war. Just as they claimed to support our troops while opposing the war, I’m going to support my country while opposing Obama and what he stands for in every way that I can. It’s only four years and with the astute Sen. Mitch McConnell of Kentucky as Senate minority leader, Republicans can stop the Obama extremists for two years until mid-term elections in 2010 give Republicans the boost in Congress that inevitably will come. And in 2012, we’ll have Sarah Palin to clean up Obama’s mess and remind us again of America’s exceptionalism. Z. Dwight Billingsly is a principal of Branford Gateway Investment Co. and a financial services industry specialist for the Missouri Department of Economic Development. He serves as co-chair of the Missouri Spectrum political action committee, an auxiliary of the Missouri Republican Party. There are conservative blacks out there! Good on ya, Dwight! Turon on his website has this posting in rebuttal to those folks who see nothing wrong with restricting Second Amendment rights. If that is applicable to the Second Amendment, it is also applicable to the other Amendments as well. See the posting here. Points well presented. An bit of information to reflect upon in this post-election period. Obama did NOT win Missouri. ACORN was very active in metro Kansas City. Robin Carnahan, the Missouri Secretary of State gave lip service to investigating the voter registration abuses by ACORN. Saint Louis, in this election as well as the last two national elections, had more voters in some metro districts than were registered voters. Kansas City and Saint Louis have long histories of vote fraud leading back to the Pendergast era and beyond. Chris Stigall is a conservative radio host on Kansas City station KCMO. He is NOT in favor of the automaker bailouts being supported by Missouri Republican Senator Kit Bond. Bond has come out proposing immediate aid to automakers. That is something even Nancy Pelosi disagrees. She says the automakers need a plan before getting any money. Not so for Senator Bond. Stigall, on his Friday, November 21, 2008 show had a parody about bailing out the automakers. Bond and some local automaker execs didn’t care for the remarks. Bond went on a tirade against Stigall claiming he was sabotaging the bailout effort and wanted the auto plant in Claycomo, MO (Ford) to close contrary to Stigall’s actual remarks. Some auto execs at the plant monitored the Friday show and called an un-named contact in congress (Rep. Cleaver, D-MO, perhaps?) and complained about Stigall. Their stance, it appears, is that anyone who is against the automaker bailout is somehow un-American. Bond directed a tirade directly against Stigall in comments over the weekend. On this morning’s show, Stigall proposed that perhaps Bond is more interested in courting the democrat and union vote in 2010 than listening to his conservative base. He reminded the Senator that even after the last election, Missouri is still a red state and perhaps Bond should listen to his party’s base rather than emulate democrats. I’m inclined to agree. The main reason the Republican party lost this last election is that they tried to match the dems as pseudo-liberals. They ignored the conservative base and when they noticed they were headed for the dumper, brought in Palin to regain conservative votes. It almost worked. But, it was too little, too late. More Republicans voted for Palin than McCain. Other conservatives, especially the evangelicals, sat out the election. The result was a overall democrat win. If we are to regain conservative control once again as we did with Ronald Reagan, the Republican old guard must go. Bond must go. The RINOs must go. All of them. The Republican party must go and the party return to its roots. As it stands now, we’ve just one party in Washington since the Republicans are doing their best to behave as democrats. That benefits no one.